The Future’s Not What it Used To Be, is an exhibition of ten international artists who explore the concepts of past, present and future. Using a range of media, the artists present multiple perspectives of their changing landscape, helping viewers to define and redefine their own relationships to the world. Susan Hiller, Vernon Ah Kee and Tony Albert give voice to indigenous cultures in the hope that we learn from the past; Marjetica Portč and Monika Sosnowska’s architectural and sculptural works investigate the poetics and politics of space; Amie Siegel and Jeremy Millar explore how events in history resonate with our understanding and experience of the present; Patricia Piccinini engages us with the changing nature of our environment; Darren Almond and Matt Bryans mark, manipulate and erase time. In 1854 the United States government offered to ‘buy’ a large area of Indian land; in return they promised a ‘reservation’ for the Indian people. Vernon Ah Kee’s lightbox commission theendoflivingandbeginningofsurvival (2012) references Chief Seattle’s profound response to this offer and comments on the social and political inequalities that continue to confront Australia’s indigenous people today. Susan Hiller’s The Last Silent Movie (2007) provokes a sense of loss as she explores languages that are extinct or under threat of dying out. The new commission that features in our café bar by Tony Albert Be Deadly / Bydd Wych (2012), inspired by the political posters of Redback Graphix (Sydney 1980-1994), plays on the stereotyping of cultures, to send out an inspirational message encouraging young people to stand together, be positive and believe in themselves as deadly, a colloquial word understood across Australia to mean ‘amazing’ ’great’ ‘the best’. In contrast, Albert’s Blak n Blue (2011) portrays the historically brutal relationship that the Australian Police have with Aboriginal people. Acre: Rural School (2006) by Marjetica Portč is a case study of a primary school built in a remote area of the Amazon forest. Portč’s work focuses on how to make life on earth more sustainable, accommodating humanity’s need for shelter, wellbeing and community. Involving and sharing in the local experience she embraces the importance of cultural identity and education in her contribution to improving living conditions. Monika Sosnowska re-sites Untitled (2006), a series of twenty-three geometric icebergs of varying sizes. These birthing parasitic sculptures take on a new life as they alter our perception of both the physical space of the gallery and our psychological state. Amie Siegel’s UK premier of The Modernists (2010) explores a cross-section of photographs and super-8 film that document a husband and wife through the 1970s and 80s and the gendered, temporal relationship to sculpture, fashion, photography and modernism that those images propose. Time travel takes Jeremy Millar on a journey to Kiriwina (off the coast of Papua New Guinea) where he sets out to conclude the work of the Polish anthropologist Bronislaw Malinowski who in 1914 invited his childhood friend, the artist and writer Stanislaw Witkiewicz, to act as his draughtsman and photographer on a never-completed expedition to New Guinea. Millar has completed the fieldwork by making a series of photographs As Witkiewicz (2009). The increasingly nebulous boundaries between the technological and the natural world are explored in Patricia Piccinini’s work. In The Long Awaited (2008) Piccinini introduces the mer-creature that seems less like a by-product of science and more like the outcome of a mythical engagement. The unexplained continues in her digital film, The Gathering (2008). As the camera pans through a seemingly deserted house, a motionless child comes in to view and gradually becomes surrounded by organisms or creatures. These are conceived by Piccinini as some sort of mistake or by-product that has escaped into the world and is living in the shadow just beyond our perception. From the future to the present, in Untitled (2007) Matt Bryans erases time through the labour intensive process of rubbing away details from newspapers. For this exhibition, Bryans transforms newspaper cuttings into an epic installation. From the epic to a single monument, Clock (1997) by Darren Almond marks the symbolic and emotional effects of time on the individual. This exhibition has been supported by the Henry Moore Foundation and Queensland Government through the Indigenous Arts Marketing and Export Agency (QIAMEA). With grateful thanks to all of the artists and also to Milani Gallery, Brisbane; White Cube, London; Timothy Taylor Gallery, London; Galerie Nordenhake, Berlin; Roslyn Oxley9 Gallery, Sydney; The Modern Institute / Toby Webster Ltd, Glasgow; Kate MacGarry, London; Sally Brand, Roger Moll, and the private lenders. 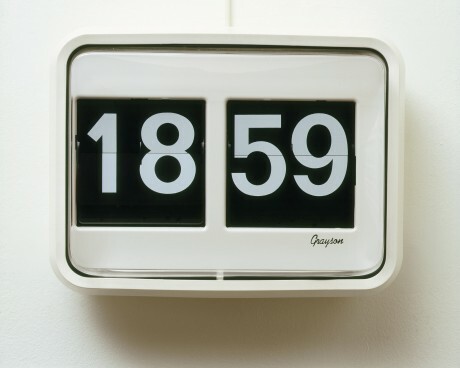 Darren Almond, Clock 1997. Courtesy White Cube. Newlyn Art Gallery, Sat 16 February 2013, 11am Curator's Talk.